I just wanted to clarify Josh’s post on the baseball “world series” for our non-American audience. 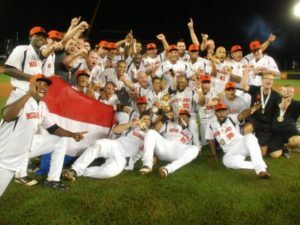 Josh was not writing about the improbable run that the Dutch national honkbal team made last week to defeat Cuba, the US, and others to become the first European world champion in baseball since 1938. No, Josh was referring to the improbable win by the team from St. Louis from the state Missouri in the North American baseball championships. See, we’re always helpful this way at the Monkey Cage. Go honkballers!